When his grandfather is found dead in horrific and mysterious circumstances, sixteen year-old Jacob Portman’s world is turned upside down. Embarking on a journey to a remote island off the coast of Wales, he discovers the crumbling ruins of Miss Peregrine’s home for peculiar children…and life for Jacob will never be the same. Every now and then it’s good for the soul to escape into the world of fantasy. For adults and teens alike, author and filmmaker, Ransom Riggs’ first fiction novel, Miss Peregrine’s home for peculiar children, which is already a New York Times bestseller, is such a delight to not only read, but to savour in a most tactile manner. The book is peppered with vintage photographs from which the story is greatly influenced. Snapshots from fleamarkets, collected by Riggs himself, the novel developed when he began to wonder who these children had been. Unable to find that out, he made up stories for them, and so they became characters in the book. Reading it also evokes that fun and strange organic experience as one by one, we meet these peculiar, ethereal characters. Not surprising at all then that Tim Burton is currently making the movie! Starring Eva Green [Miss Peregrine] and Asa Butterfield [Jacob], this is a match made in cinematic heaven. 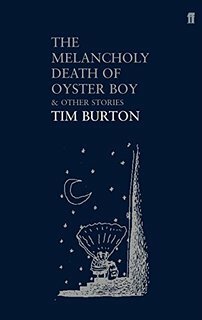 Due out in 2016, if you’ve ever read Burton’s The Melancholy Death of Oyster Boy and Other Stories [also a keeper in the Librarian’s Cellar] you will know why this one must have been so appealing to him. This entry was posted in The Librarian's Cellar and tagged Asa Butterfield, Hollow City, Library of Souls, Mis Peregrine, Oyster Boy and Other Stories, Ransom Riggs, Tim Burton.